An executive summary is the first section of a business planNon-Profit Business PlanA non-profit business plan is simply a roadmap of the non-profit organization, which outlines the goals and objectives of how it can achieve the targets. A or proposal that provides a brief overview of a document and contain its main details. In other words, it is a condensed version of a complete business plan or proposal. It is primarily used in the business world, but its application in academia is also possible. Generally, an executive summary is relatively short with an average length of one to four pages. It should be written in short paragraphs using clear and concise languageThe Language of Business – Do You Speak It?In the language of business, there are three key words – accounting, finance, and economics. While there are many other disciplines in business, such as marketing, human resources, operations, etc., it’s the core principles and terminology behind accounting, finance, and economics that drive decisions appropriate for the target audience. One should know well the target audience of the documents to convey the message as clearly as possible. In addition, the summary must have a similar structure and flow as the main document. The executive summary must not be confused with the abstract of the document. The abstract is a complementary overview of a larger document that does not provide much value to the reader by itself. On the other hand, the executive summary is a shorter version of the main document and can be read separately because it provides all the key points of the document. 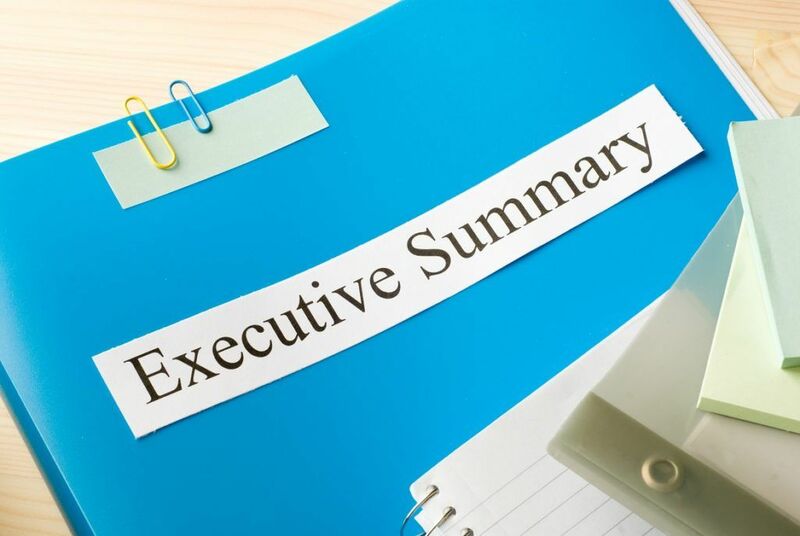 The primary goals of the executive summary are to provide a condensed version of the main document and to grab the attention of the reader(s). Since the readers of the business plans and reports (investors, lenders, and C-level executives) generally do not have time to read all lengthy documents they receive, only a well-written summary can help you to grab their attention and subsequently achieve your business goals. As the executive summary is the initial representation of the complete document, it should cover the main parts of a plan or proposal and indicate the points that would be elaborated in the final document. Cover LetterCover LetterA cover letter is an official letter expressing interest and why you are fit for a position at a company when applying for a job. Professional ReferencesProfessional ReferencesProfessional references are persons who can vouch for your qualifications for a job based on their insight into your work ethic, skills, strengths, and achievements. Typically, a professional reference is a former employer, client, colleague, teacher, supervisor, etc. Resume Power WordsResume Power WordsResume power words are words or phrases that help a job applicant’s resume stand out from the rest. They are usually action words that are striking and help describe tasks and responsibilities that were handled in past jobs.